As much as I love Lyft Line (I’ve used the car sharing service over 100 times) and continue recommending it to friends, it has its quirks and odd patterns. I’ll continue using Lyft because they’re the more conscientious choice over Uber, but it’s not a perfect product. For the most part, the speed bumps I experience are slight annoyances where the positives outweigh the negatives by a long shot, but there is one issue that has consistently been problematic. 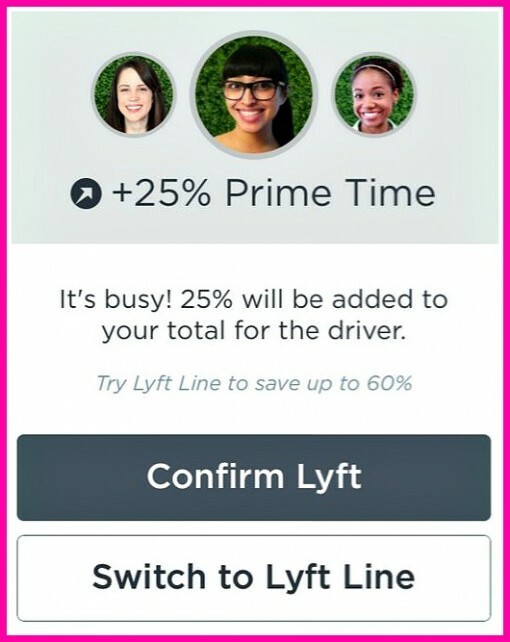 When Line and Prime Time, two well-known features, happen at the same time, it can cause issues for Lyft Line users. As previously explained Lyft Line is a carpooling option that splits the cost with other passengers headed in the same direction; allowing a 50%+ savings. When it’s Prime Time, Lyft works on a different algorithm; one that works on supply/demand. Prime Time determines an additional percentage (e.g. 75%) to be added to your ride’s final cost to “encourage more people to drive when Lyft gets really busy”. The problem is when it’s Prime Time (raining, snowing, etc. ), it becomes very difficult to use Lyft Line. I’m not bothered by the stronger demand for drivers, that’s understandable, but the promise of more money causes some drivers to behave badly. Multiple times I’ve requested a car via the Lyft app, told that a car was on its way, only for the driver to cancel after a couple minutes. When it rains, it pours — pun intended. Under the high-demand Prime Time, I’ve sat in front of a store for 20 minutes waiting for a Lyft driver just to accept only to have them cancel. Even worse, there are times when drivers accept the request then find out that they can make more money from a regular Lyft ride (or Uber, because many drivers use both apps) so instead of coming to pick you up, they’ll sit in traffic so you cancel. These unscrupulous drivers do this because they don’t want to cancel the request. If the driver cancels on their side, it impacts their Driver score and the rating goes down. If a passenger cancels, it doesn’t hurt the driver’s score. I’ve often had drivers call me after accepting a request saying that they can’t pick me up or make up some excuse not to pick me up. There was one driver that asked me outright to cancel the ride. I’m not sure what the answer is curbing this behavior is — is it punishing drivers for excessive cancellations or spreading the Prime Time money to drivers accepting less-attractive Lyft Line requests? Whatever the solution, the company needs to do a better job of monitoring this pattern of behavior during Prime Time. Lyft Line users like the cheaper alternative and drivers like more money so something has to give. We appreciate you reaching out to us about this, and I understand how frustrating the experience may have been for you. Our drivers may cancel a ride they have accepted if need be. An example would be emergency situations, they may have accidentally cancelled or they feel that they will not be able to reach you in time. Cancellation is definitely a bad experience for anyone and it is something which we hope should not happen too often. We truly value your feedback about this incident. We want to make sure that Lyft is accessible for everyone to use safely, efficiently, and enjoyably. We’ll be reviewing your ride requests that were cancelled during Prime Time and will reach out to the drivers involved as needed. We appreciate the suggestion you gave and we’ll keep this in mind as we create future updates aimed to better improve the kind of service that we have. Thanks again for reaching out and expressing your concerns. We are always looking for ways to make our service better for members of the Lyft community and therefore your feedback is much appreciated. If you have problems with excessive cancellations as I have, I suggest contacting Lyft customer service. Their support team is responsive and has always made me feel like a valued customer.